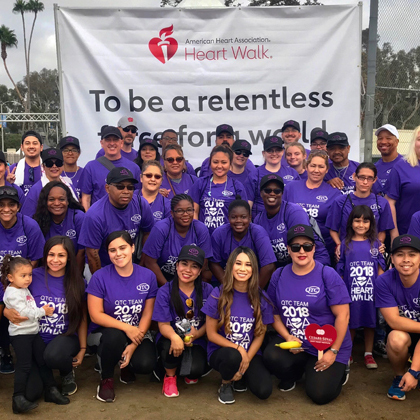 On Saturday, September 29, 2018, 80 QTC employees, along with family, friends, and pets participated in this year’s Heart Walk hosted by The American Heart Association. The event took place in the historic city of Pasadena, California at the world renown, Rose Bowl Stadium. The day’s events began with a 3-mile walk around the Rose Bowl that loops around a scenic park, the stadium, and a golf course. A backdrop of picturesque mountains and sunny skies greeted walkers from beginning to end. The festivities continued at the health expo where various wellness booths, a kid’s zone, and family-fun activities and healthy snacks kept all attendees in cheerful spirits. At QTC, giving back and engaging in community outreach activities is an essential part of our culture. A great deal of gratitude goes out to all our walkers, donors and volunteers who accepted the challenge to help fight heart disease and stroke. Together we were able to raise $4,876.12! We cannot achieve our mission without you! We thank you from the bottom of our heart. Click here to read other fundraising event posts by QTC.